THE passion of a West End environmentalist in looking after a patch of local heathland was celebrated in a special Mother’s Day episode of the BBC TV’s Countryfile programme. Mary Adler’s many years of conservation work on Brentmoor Heath were featured, including her efforts in helping save the land from housing development. 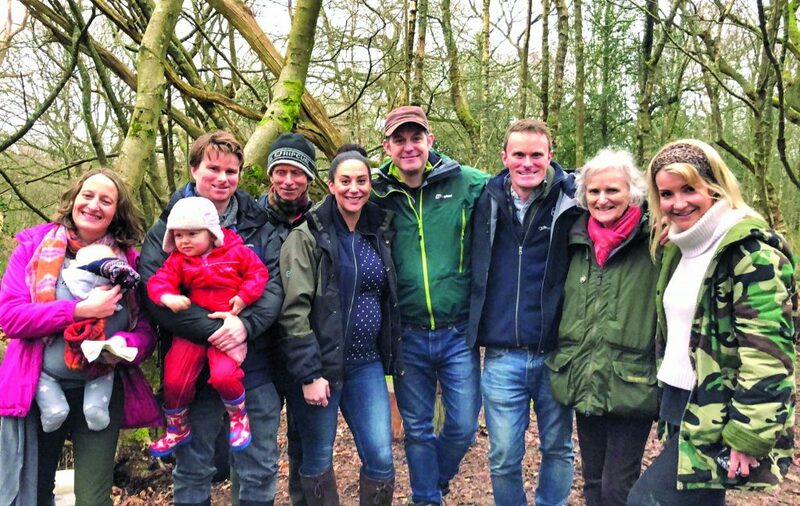 Countryfile presenter Matt Baker and a camera crew met Mary on the 75 acres of countryside which surround her home at New England Hill, off Red Road. She was described as “a remarkable woman who has embodied the spirit Surrey Wildlife Trust for more than 30 years, who was made an MBE for her work to protect and enhance the heathland”. Countryfile highlighted Mary’s success in inspiring several generations of children to become interested in conservation – including her son James. He recently became head of biodiversity for Surrey Wildlife Trust (SWT), which now manages Brentmoor Heath. Mary is still a registered volunteer with the trust and continues to take a keen interest in the nature reserve and the surrounding countryside. “We walk the area twice a day and do a lot of litter picking and clearing up the packets which dog walkers unfortunately leave behind,” she said this week. “If I see any problems or anything which needs attention, I let the SWT warden know. Countryfile closed its Mothering Sunday tribute by filming Mary’s granddaughter, Emma, 2½, attending a Wild Tots session at Nower Wood Education Reserve at Leatherhead. SURREY Straw Switch took off in Woking town centre as local outlets serving cold drinks to sip or slurp raised their glasses to a plastic straw free future. 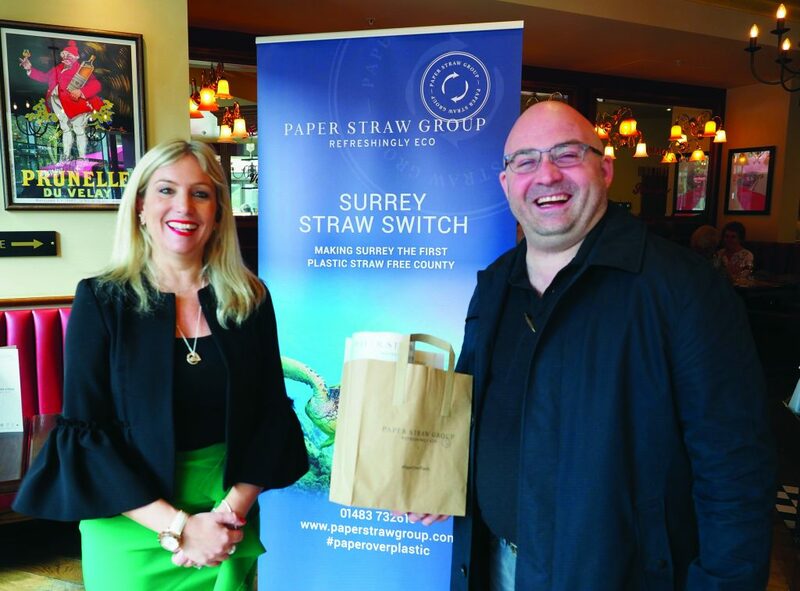 The Woking-based company Paper Straw Group gave away around 6,000 paper straws as part of an initiative backed by the local council and Surrey County Council to be the first plastic straw free county. Having set up a station for the event at Café Rouge in Victoria Square, Natalie Stephens, managing director of the Paper Straw Group, and her team gave away packs of their bespoke paper straws to businesses that currently offer straws to their customers, including Patches of Horsell, the New Victoria Theatre and Café Rouge itself. In addition to Woking Mayor Cllr Will Forster and a number of other local councillors visiting the launch, councillors from Epsom and Ewell also visited as one of the districts that is looking at holding a similar launch. The straws are being made in Woking with UK materials, including vegetarian-friendly ink, on bespoke machinery. This includes 100% plastic-free glue, which is one of the factors that the company has said makes it stand out from other similar products.